Huge Savings Item! 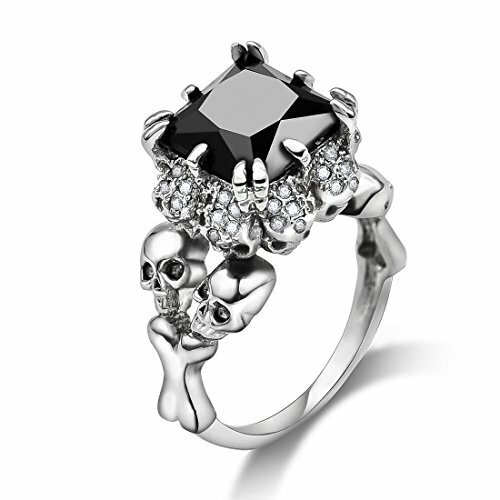 Save 18% on the DALARAN Gothic Jewelry Skull Ring Size 9 Silver Band High Polished Comfort Fit Women Men Accessories by DALARAN at Resha Laser. MPN: ASRV03NI2314E1K9E. Hurry! Limited time offer. Offer valid only while supplies last. ❄ Material:Copper + high quality Cubic Zirconia. ❄ Size:US 9#;Diameter:18.9 mm;Weight:about 6.8 g.
❄ Cool cubic zirconia ring with creative skull design,white gold plating makes it more stylish,clear cubic zirconia make it more eye catching.When wearing it,you are the Party Queen. ❄ Package included:1 piece ring +1 piece neat gift box. ❄ 90 day money back guarantee or exchange and if you have any questions or receive the wrong items,please contact us,we will help you within 24 hours. If you have any questions about this product by DALARAN, contact us by completing and submitting the form below. If you are looking for a specif part number, please include it with your message.